← Bolivia has “changed” thanks to the egocentric coca-grower leader … WTH! Esteban Quispe Churata, the creator of the replica of the Bolivian Wall-E, is benefiting, starting this semester, with a scholarship in the career of Mechatronics Engineering at the Universidad Católica Boliviana. He is in first semester and already stands out in his career. A year ago Esteban gained notoriety by creating a robot from recycled elements obtained through the trash. Inspired by the movie Wall-E from Pixar, carried out his project in order to, in the future, create a robot farmer that would help his community (Patacamaya) and curb the migration of young people to the city. The dean of the Mechatronics Engineering School at UCB, Humberto Calderon, said Quispe was granted a scholarship for his creative craft constructions of robots that were presented at student science fairs. “He is not only a potential scientist, but also a very nice person, with many values. It is an accumulation of things that led us to offer full scholarship at the UCB”. In this new academic stage, he imagines machines which inspired new projects and challenges. 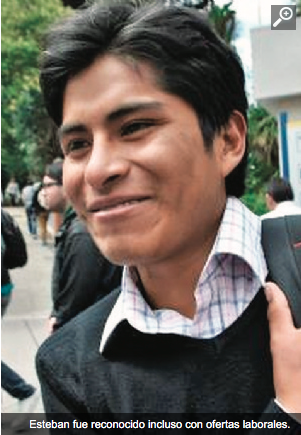 “Here I want to learn more, more than I know, I’m satisfied with what I have, I like to learn more, there are goals to accomplish in this university,” said Quispe. To encourage his work, the School assigned him a laboratory space “not to kill his creativity” because “he is a very fast person.” His first known creation was the result of a self-taught formation which began with robots that were controlled from his phone. As a former UCB student, I feel proud for their decision. People like Esteban Quispe deserve it! Kudos to UCB and I welcome Esteban to The Hall of Bolivian Fame! This entry was posted in Bolivia, Business, La Paz and tagged competitiveness, innovation, scholarship, UCB. Bookmark the permalink.